A quick review of an exercise that WILL get your biceps bigger and stronger. The seated Barbell Biceps curl is one of the very best partial rep exercises to perform to overload the biceps muscle. Because you are working within a shorter range of motion and at the starting point within the movement that the biceps become most activated you can significantly overload the biceps to get massive growth and size. This movement was mastered back in the day by Joe Weider and using the overload Principle the objective is to load up the weight with this exercise. You see when performing regular biceps curls, you start with the arms straight. 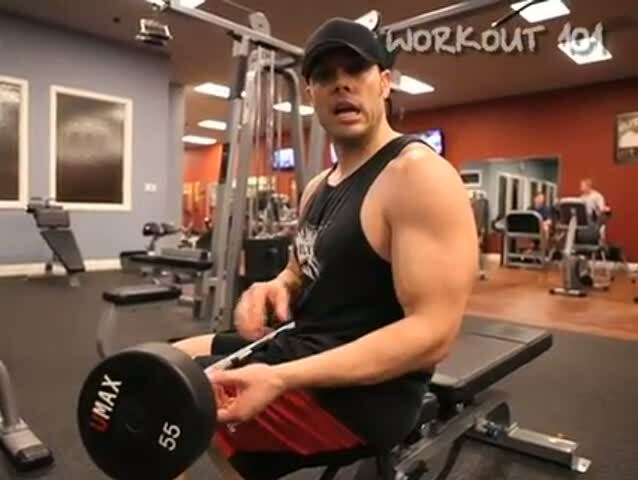 Because the biceps are not fully activated in the initial phase of the biceps curl you are somewhat limited to the amount of weight you can curl upward. When in the seated position, you are in a better position to emphasize the biceps muscle at the start of the movement. This gives your biceps muscle the advantage because you are starting at the muscle strongest point. With this the objective is to go heavy and curl the weight upwards and slowly lower back down to your lap, resetting and curling again. To download the program click below on the under the video and I encourage you all to sign up and upgrade your account so that you can take advantage of more features within the system including the workouttrainer.com iphone app.